After my last post, quite a few people told me they want to run the Dipsea trail sometime. I absolutely loved it and highly recommend! However, let's say it wasn't the easiest to find from the Mill Valley side and we didn't study our map well enough because we went on a whim. This post is dedicated to how we got lost and how you can avoid our mistakes when you head to the trail. Enjoy! Parking - We drove to Mill Valley and parked near Old Mill Park. There is quite a bit of street parking just outside the park on Throckmorton Avenue, but we turned into the park, went left up a hill on Molino Avenue and parked in a small lot there. Note that there were lots of cars parked in the area, so parking might not be super easy depending on time of day. Trailhead - Finding the trailhead, i.e. the staircase, from the park was no easy feat. Perhaps we are just clueless, but we definitely weren't the only ones wandering around looking for it. From the park, you'll see a place toward the hill where three roads meet; the roads are Molino Avenue, Cascade Way, and Cascade Drive. 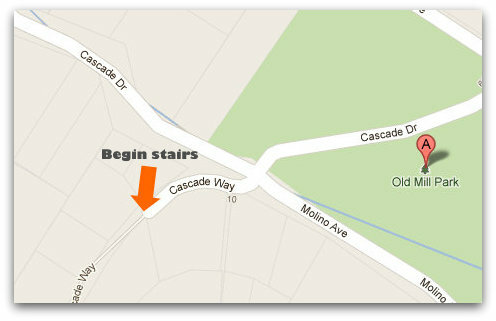 It looks like a driveway but don't be fooled - Cascade Way is your road to the staircase. Once you go up the short hill and around the corner a little you see the unmistakeable Dipsea stairs. Repeat photo - but emphasizing the stairs. When you get to the top of this staircase, you are on a road where it is again unclear how to proceed. Go right, follow the U-turn of the road, and find the next staircase. Go up these stairs and find another paved road. This time turn left and find the next set of stairs by a house. There is a fancy 'Dipsea' sign on the side of the house on the staircase, but at first glance it looks like the stairs just go to the house. Nope! Go up. At the top of this staircase, you are done with stairs. You'll come out on Edgewood Avenue, where the cars are zooming around the corner not really watching for people. Be careful crossing the road. 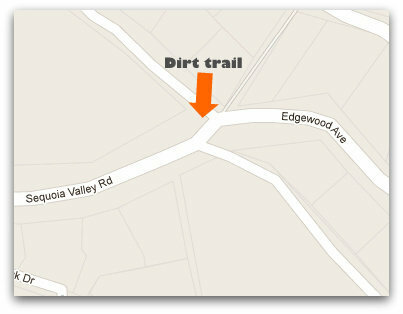 You cross Edgewood and go on the dirt trail on the corner, to your slight right from the stairs. This is the dirt trail that fooled us. It looks like the trail veers off to the right, and if you go that way it takes you into a reservoir area. It's pretty, but it won't get you anywhere but running in circles. We weren't the only ones who ended up there either. 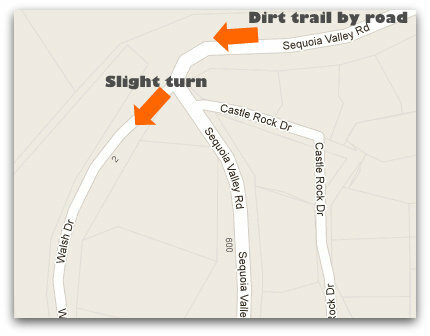 Instead, follow the dirt trail along Sequoia Valley Road straight and slightly to the left. When the dirt trail ends, the road veers to a sharp left. Don't follow the road. Go slight left/straight here onto Walsh Drive, which looks like another driveway type road. Keep climbing up this hill along the road and you'll soon see the clear entrance to the Dipsea trail. 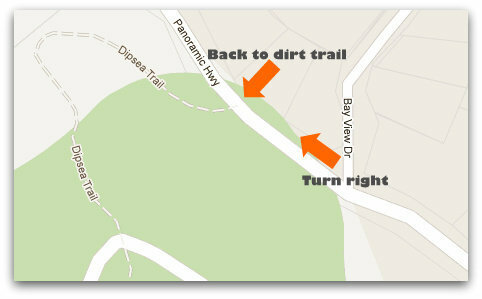 You follow this dirt trail for a short time, and then you are popped back out on to a road called Bay View Drive. I was questioning that we went the right way, but then we saw other hikers coming own the hill. You'll pass lots of pretty houses on the hill as you climb, and then you end up on Panoramic Highway at the top. From here it's easy to see where you need to go; cross Panoramic Highway, go to the right and you'll find the dirt section of the trail again. After this point staying on the trail isn't bad because it is well marked. There are a couple of places where you can end up on fire roads - which we did once - but they seem to lead back into the trail easily. You also cross the back Muir Woods parking lot (water fountain!) and then continue on the trail, but you'll see the signs. We didn't go all the way to Stinson Beach this time, but I've done that part of the trail from Muir Woods in the past. From my experience, it was a little easier to follow the trail from Stinson that it was from Mill Valley. 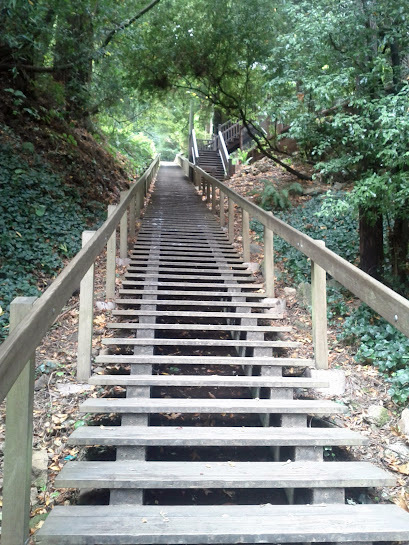 But if you miss Mill Valley, then you miss the stairs...and they are pretty awesome. Even my calves thought so. Now you know what not to do - go out and enjoy this awesome trail! I'd loooooooove to run Dipsea!!! thanks for this post - doing it tomorrow!